The Mark LDA SWIRL design water-supplied ceiling grid heater has been developed to fit into 600×600 grid type ceilings. The unit is easy to install due to its compact dimensions and is also perfectly suitable for rooms with low ceilings. Of course it is also easy to install as a free hanging unit. 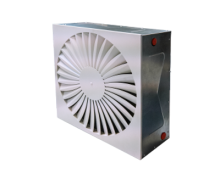 Due to the modulating EC fan, the Mark LDA SWIRL is available for a wide range of air volumes and heating capacities. The EC fan also ensures a quiet and energy efficient unit. The LDA is designed for use in stores, offices and hospitals.